Trigger warning: If you suffer from globophobia, this post may be very disturbing. I do not suffer from this hilarious psychological condition, and this is still kind of creeping me out. It’s large. In fact, I joked to Michelle that the balloon will make it feel like I have a roommate. It may be bigger than some of the children to whom its helium-filled brothers are given. It also differs from most balloons in that it has points — a head and arms, if you like. Have I ever mention that my apartment is drafty? Well, it is. Perhaps you can see where this is going. The first time: So I’m in the kitchen, washing dishes and I hear this peculiar scraping noise. Scraaaape. Scraaaape. Scraaaape — pauses in between and then the noise for a few seconds at a time. I stopped washing to hear the noise better. Scraaaape. It was getting closer. 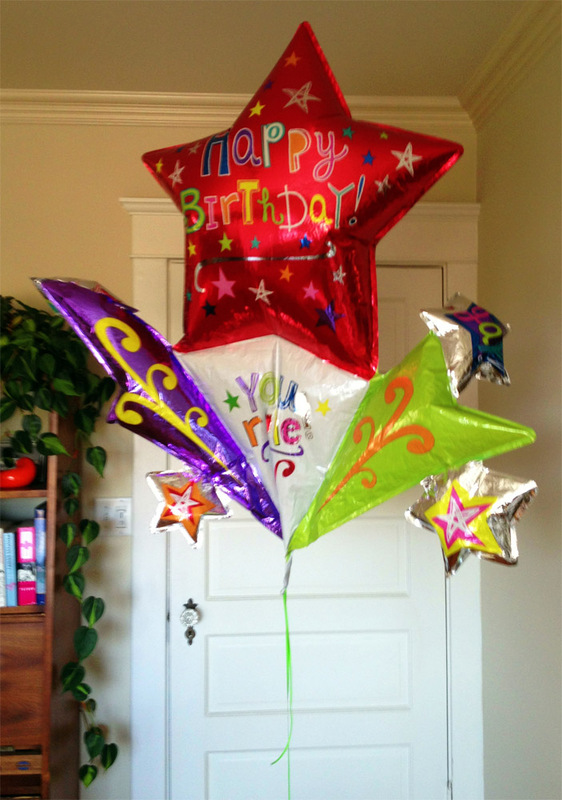 So I dried my hands and stepped into the dining room to immediately come face-to-face with the birthday balloon. I jumped. Were it a horror movie, it would have been punctuated by a blast of music. The second time: I’m reading in bed. Straying over the top of the page for a second, my eye catches movement down in the darkened hallway. At the other end of the hall is the dining room, empty but illuminated enough by the streetlights outside that I can make out the silhouette of the balloon pass by the doorway… very… slowly. It makes little crinkly noises as it moves around my apartment. The third (and final) time: I won’t even try and build up suspense with this one. A few nights later, I woke up and the balloon was in my bedroom, right by bed, kind of like it was looking over me. I know I said something out loud — maybe “Oh Christ” or maybe just “nope” — and I immediately locked it in the closet. I’d just pop the ballon now, but I’m worried doing that will release the ghost that’s maybe causing all this creepiness and who is perhaps better off trapped in a mylar prison. Seems logical, right? This is the wisdom you get with age.